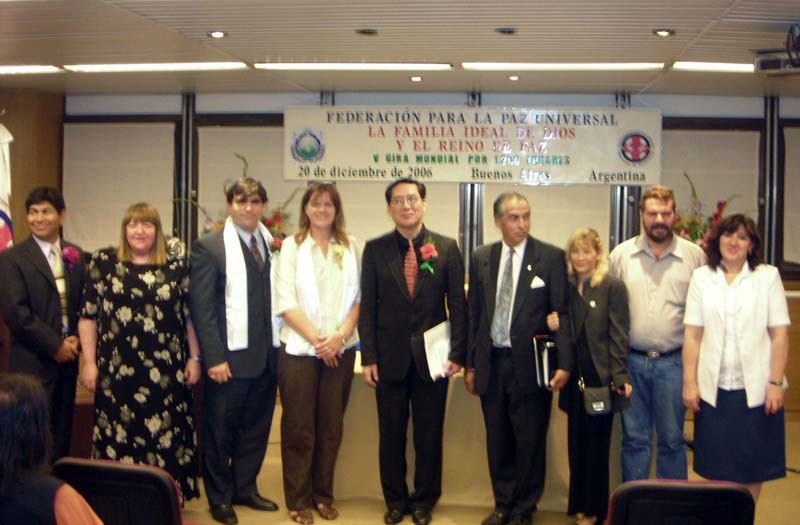 The official Event of the V UPF World Tour for Peace was held on Wednesday, December 20th at the Peace Embassy in Buenos Aires, Argentina. We had the special visit of Rev. Dr. Peter Chu-Liang Chao, of the Protestant Reformed Church of Winfield (Woodside, New York), which is the first Taiwanese Church in New York and is headed by a 3rd Generation Missionary. Before that, Architect Nicolas Incolla Garay, Peace Ambassador, gave an outlook over the topic: “A Sea Port for Bolivia”, as part of the cycle of Conferences of UPF 2006, together with accountant Jaime Fisher, who is working as an assessor to endow the project. The project, which attracted the keen attention of the guests, involves three countries -Bolivia, Chile and Peru in an architectural and technological master work, with the vision of spanning the integration of the region and will also lower its tensions. Peace Ambassador Sarita Vigna was the Master of Ceremonies of this part of the Event. Andres Melgarejo, the General Secretary of UPF in Argentina, then presented Dr. Chao. With the help of Gloria Dantas translation, he revealed that his father had been missionary to Argentina in Buenos Aires some 20 years ago. For this reason, he stayed a couple of weeks in Buenos Aires, where two of his nephews were born as well. Therefore he said he was very glad, when the chance came up to visit Buenos Aires again and is considering it his third home, after Taiwan and New York. Dr Chao explained that his father was President of the Presbyterian Church of Taiwan and some 25 years ago was invited by Father Moon to Korea. Some 20 years later after this incident, when Dr. Chao was named Peace Ambassador in the United States, he explained that “when Rev. Moon shook my hand, he still remembered my father. Rev. Moon really has an exquisite memory; and I wish, that God will grant you a great memory as well, to be able to remember me”. Dr. Chao shared that the tragedy of the Twin Towers (9/11) had a great impact on him personally and he found herein the reason for becoming a Peace Ambassador. He is also part of the oldest Taiwanese Church in New York, which has about 150 members and has written 2 books in Mandarin (Chinese) containing his sermons. 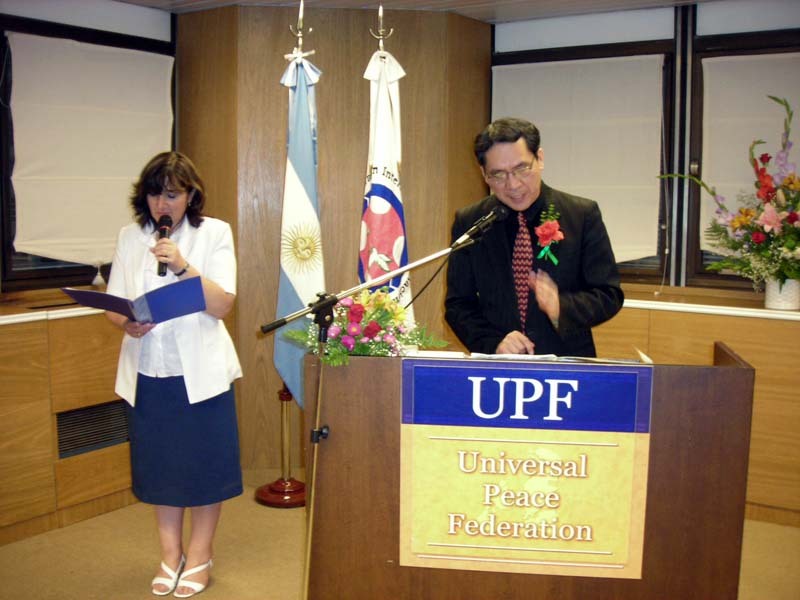 After having shared the UPF Founder’s words usual program continued with a World Peace Blessing and the naming of a new Peace Ambassador: Professor Berta Bilbao. 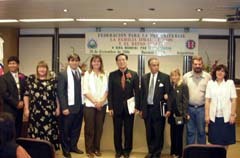 There was also much applause for Peace Ambassador Luis D’Angelo for his prices won for his Radio work and finally the usual refreshments were shared, while many participants where taking uncountable photos together with Dr. Chao.